Midfielder Jonathan Williams says he decided to join MK Dons on loan from Crystal Palace in a bid to secure a place in Wales' Euro 2016 squad. Williams has appeared only once for Palace this season but played 10 games during a loan spell at Nottingham Forest earlier in the campaign. The 22-year-old has joined Dons until the end of the season and is pleased to be playing regular first-team football. 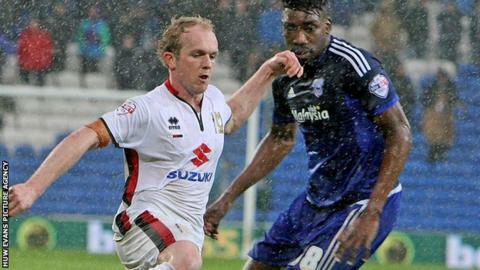 "The main aim this season is to keep MK Dons in the league," Williams said. "If we manage to do that and I play well then hopefully I'll get into the Wales squad. "It's one of those things that might only come around once in a lifetime. "To be part of the squad that got there was amazing and I'm looking forward now to hopefully going to France, and the only way to do that is to play well and stay fit. "I worked hard to get fit to play a part in the qualifying campaign and it would be great to be involved in the finals." Williams has featured in Wales' previous two games - the 2-0 qualifying win over Andorra in October and the 3-2 friendly loss to the Netherlands the following month. Injuries limited Williams to just 11 club appearances last season, seven of which came during a loan spell with Ipswich Town in the Championship. Palace manager Alan Pardew has said Williams needs to do more to impress him and has allowed the Kent-born player to join Championship strugglers MK Dons on loan. "The manager Karl Robinson gives me a lot of freedom to play and hopefully I can feature in as many games as possible between now and the end of the season. "I'm getting back to my old self. I'm getting my confidence back and getting back to playing how I was before getting injured."